James Healey, the auto writer for USA Today, has added gallons per 100 miles to his car reviews. In his Prius review, he writes: "How thirsty? Rated 51miles per gallon in town, 48 highway, 50 in combined driving. That's about 2 gallons per 100 miles, using the gallons-per-mile index that's emerging as a better measure of fuel use and cost. Trip computers in preproduction test cars showed: 56.2 mpg in suburbs (1.78 gallons per 100 miles); 48 mpg highway (2.08 gal./100 miles)." In a chat session, a curious reader asked Healey: "I noticed the peculiar gas mileage listing in the Prius article, 1.78 gallons per 100 miles. What's that about?" Healey replies, "It is, some folks argue pretty effectively, a crisper and more relevant way to compare vehicles and get a quick handle on the difference in fuel use and cost. 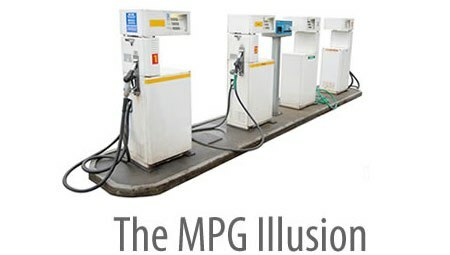 A hybrid might use 2 gallons per 100 miles ($4 at today's prices) and a gasoline economy car might use 3 gal./100 mi ($6). You pretty quickly can decide from those numbers if the price premium for a hybrid is worth saving 1 gal. ($2) every 100 miles. Or take it out 1,000s -- 20 gallons ($40) for 1,000 mi. vs. 30 gal. ($60) per 1,000 mi. It's a takeoff of the Euro system, where fuel consumption is stated in liters per kilometer. Because the distance usually is fixed -- you drive 300 miles a week, week-in, week-out, for instance -- you can get a fast notion of consumption and cost."